This is where and when it all began! 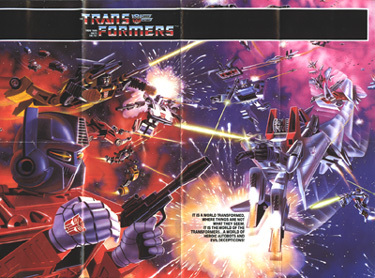 Ladies and gentlemen, children of all ages; allow us this opportunity to introduce Optimus Prime, Megatron, Starscream, Jazz, Prowl, Soundwave and the characters who started the legacy! Years later, they became known in fan circles as, "G1," that is, Generation One! This section is dedicated to the original Transformers of 1984! The boxes of each toy are links to pages dedicated to that character. On each page you'll find screen captures from the cartoon, photos of the toy in each mode, & a written description including character profile, abilities & weaknesses. 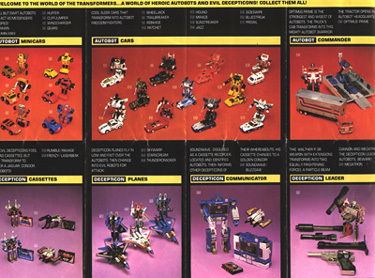 Toys are listed in order of their appearance on the collector pad shown above. Visit each one & learn about all of the originals, who are definitely "More than Meets the Eye!"